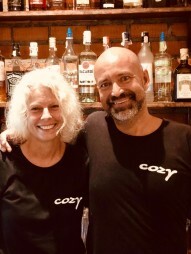 Swedish owners of Cozy Guesthouse since August 2015. Anders has been in the restaurant business since he was 17. His idea of good food is to make it simple and tasty, without too much frills, with good and fresh ingredients. Lindas has been working the last 15 years as a nurse in emergency healthcare. If you ask her – it’s not that big difference in running a guesthouse from working in the ER. You have to solve upcoming problems, preferably easy and quick and you never know what to expect from a new day. 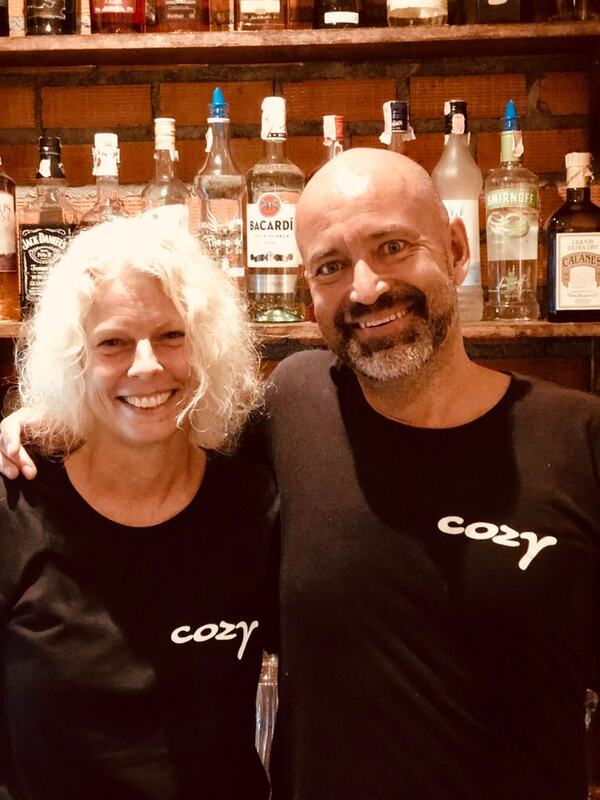 Bamboo has been working at Cozy since the very beginning 100 years ago. His humor is well known and appreciated by our guests. For our regulars - he don't need any further presentation... You'll find him mostly in the reception, in the bar or in the restaurant or you can see him fixing leaking taps, broken chairs or any other kind of construction. A key person in our team! Doing the dishes and assist in the kitchen is maybe not ALWAYS the funniest job to do in a guesthouse, it is a special kind of person who comes to work every day doing this - without ever complaining or bringing a bad mood. Apple is this kind of person. You won't see her very often, but you can be sure she is there and she guarantees your food is served on a clean plate. A big "thumbs up" for Apple, we are happy to have her in our team! Go is doing her first season at Cozy and we are so happy to have her here! With a calm, confident, kind and smart personality she immediately became an important part of the Cozy-team and she also quickly became very popular amongst our guests. She is always in a good mood and willing to share her smile. Go is most likely to find in our reception, bar and/or restaurant where she is taking care of both guests and staff who needs someone to turn to. Kim came to us in high season this year when we were in a critical need of extra hands. This is not an easy assignment - little time for learning and under hard pressure from guests and the rest of the team. We where afraid that we scared her off her first evening - but she proved to be stronger than that, and her personality is now doing well in our sometimes chaotic environment. Calm, willing to learn, rigorous. She is a multitasker, like most staff in our team, so you will find her in our reception /bar/ restaurant or wherever. We are very happy she found her place with us! Lix came to us in our third season when we needed him the most and he immediately found his place at Cozy. His Thai food is praised by our guests and he is interested and curious, with many ideas - good qualities of a chef. Lix is to be found in our kitchen, a place he knows well (he has also been building parts of it!) and like. Cooking for him is a show which he performs with 100% commitment. We are happy to have him in the Cozy kitchen! Dtew came to Cozy in our third season and proved to be a success. She scores great reviews and many, many compliments for her cleaning. She is meticulous and careful. You can see her everywhere in our guesthouse, wiping and sweeping, helping with dishes and also assist in the kitchen during breakfast. Cozy has never been as clean as it is after she entered our doors. She is a star and a very important person in our growing team. Wan has been working with us since we started this adventure and is now doing her fourth season with us. Free-spoken, open-hearted and funny. She is also an artist, which can be seen in her food arrangements (and on the walls in our guest toilet!). You'll find her in our kitchen and if you are very lucky - you might have a glimpse of one of her famous dances... The Cozy kitchen without Wan wouldn't be a cozy kitchen! Another young and charming personality combined with a long time experience from the restaurant and hotel business - Pim. Proffessional, effective, quick and with loads of energy... As a guesthouseowner you cannot wish for more. Pim is doing her first season with us but it feels like she has been with us for long time. She is mostly in our restaurant but if you stay in our hotel - she might check you in or book your trips as well. Inspiring to have her in our team!